Overdue pictures from my trip to Milwaukee. But today, November 4th, is also the Feast of St. Charles Borromeo. Son of a Medici, and nephew of a Medici Pope, Pius VI. Having the right family connection he was appointed Cardinal of Milan (Italy) at the age of 25, not even being ordained! But rather than squandering his position which he received, he took it as a responsibility and studied to be ordained. 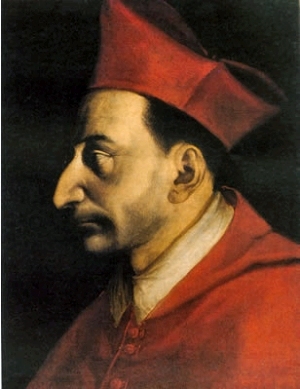 Using his influence as the bishop of an important diocese (Milan), as well as family/church connections (Medici's/Popes) he was instrumental in what is called the Counter-Reformation, centered around the council of Trent in response to the Protestant Reformation. Charles helped to institute many reforms, was instrumental in the founding of the seminary system, Sunday Schools for the systematic instruction of children. He survived and assination attempt by members of the heretical sect, the humiliati. He also wrote the Catechism of the Council of Trent, which remained the official catechism of the Roman Catholic Church until the current one was issued in the 1990's. Charles died in 1583 at the age of 46.